Learning how to draw lips and mouths is essential if you want to create better portraits or character concepts. Have you ever drawn a mouth that comes out looking really flat…and you’re not sure what you need to do to give it a more natural feeling? That’s where this easy-to-follow video course from Sycra Yasin will help. You see, this is actually a problem many artists have when they first start learning how to draw lips and draw the mouth. In the first lesson, you’ll learn how to overcome this problem by understanding and seeing the mouth as a three dimensional object. So, if you learn just one thing from these video lessons on how to draw lips and mouths, this may be the big breakthrough you need to have the biggest impact on your drawings and help you create natural-looking mouths. These video drawing lessons will teach you how to draw lips and mouths with a system that is both easy to understand and designed to give you great-looking results! Sycra Yasin is a master at breaking down the face into easy-to-understand parts, and he’ll be with you every step of the way throughout this series. And, once you’ve learned how to see the mouth as a 3D object (it’s amazing how much difference this makes, by the way), it’s time to learn how to draw lips. You’ll do this using a ridiculously uncomplicated system that breaks the lips down into simple shapes. 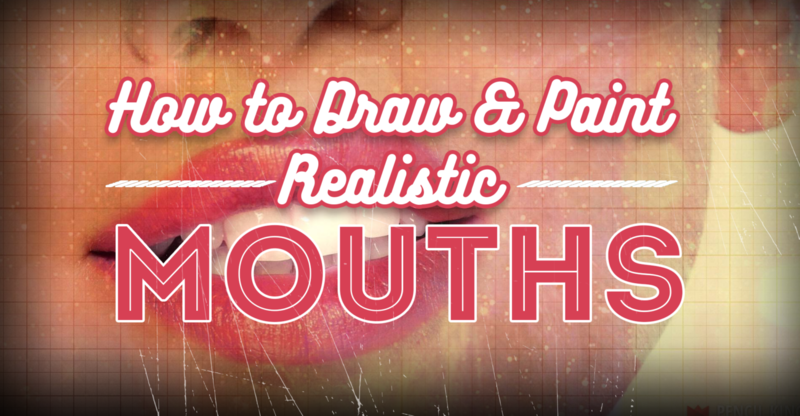 Before you know it, you’ll know exactly how to draw realistic, full lips with real depth to them. You’ll also learn about basic shading of the lips – as well as where not to shade. So, are you ready to dive in and learn how to draw lips and how to draw a mouth? See you inside!